SMR is a measure of fear in the market. 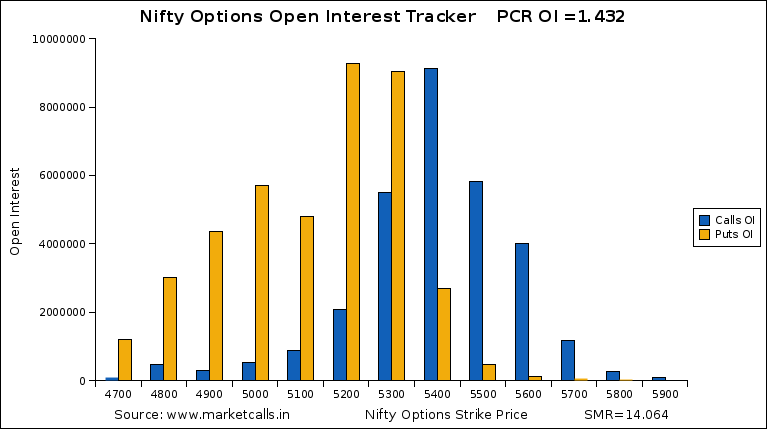 A value of less than 20 indicates that market is lack of fear and volatility and the higher PCR ratio(greater than 1) supports such kind of action. And a value of 60 or greater than 60 indicates too much of fear in the market which is highly motivated with lower PCR ratio (less than 1). It is a kind of indicator which provides information about which kind of market we are right now. Great!! needed this for long, if possible please plot graph for PCR and SMR. Good going keep it up. what’s your opinion on nifty still intact in uptrend -- tgt. or key support has been broken ? a clear cut resolution occurs. How are you hope all is well at your end ! Thanks a lot for the help and knowledge, really loved learning new things from the site. Sir request you to post a article on how get monthly quarterly and yearly pivot of stocks and indexes, as per monthly pivot is also very helpful for trading and pivot points can help a short term trader. Please sir I cant figure out how to get the data from and where to get the data from. Sir one more thing can you post an tutorial on how to create such OI charts of stocks and indexes and what all information is required to be put into it, wanted to create more OI charts of other stocks also, so if possible can you share the samples or provide the down loadable links of the above charts..
OI really is very helpful to be on the safer side..
any link where i can get historical SMR values?